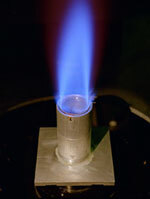 This low-swirl burner uses small air jets to swirl the premixed flow inside the burner tube, providing a stabilized lean premixed combustion. This ring stabilizer keeps the flame steady under both fuel-rich and lean conditions and helps produce more complete combustion, which increases efficiency and reduces pollution. Humankind has been using combustion ever since we discovered how to make fire. This critical chemical process produces energy for thousands of different applications, including industrial processes, electric power production, space and water heating, and transportation. Unfortunately, combustion also produces pollutants: nitrogen oxides (Nox), carbon monoxide (CO), and unburned hydrocarbons (HC). For years, we have known only one way to decrease the amount of toxins released from gas burners: create a burner flame with a higher air-to-fuel ratio. However, these so-called lean flames tend to blow out with the slightest breeze. 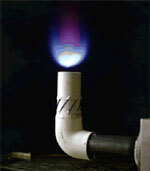 Now the challenge of creating a clean, stable, safe flame has been solved. Mechanical engineer Robert Cheng has created the UltraClean Low Swirl Combustion, which combines two technologies to produce a cleaner, stable flame. The burner releases much less NOx than conventional burnersfewer than 10 parts per millionand lowers CO and HC emissions. This technology is available for licensing in selected fields of use from Technology Transfer Department. It is also exclusively licensed to Maxon Corporation for certain fields of use.